#6. 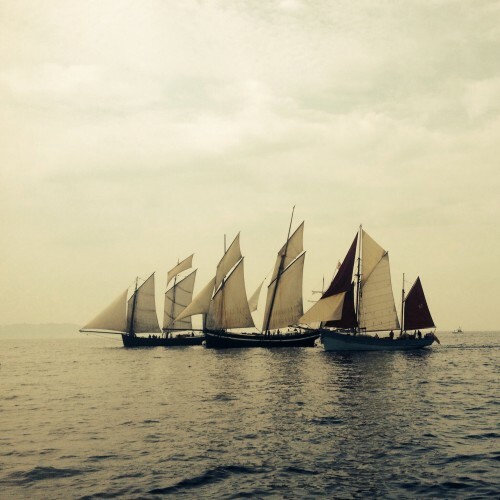 Falmouth – Douarnenez – Sampson Boat Co. Some time later, and suddenly it was July and I was still in Cornwall! 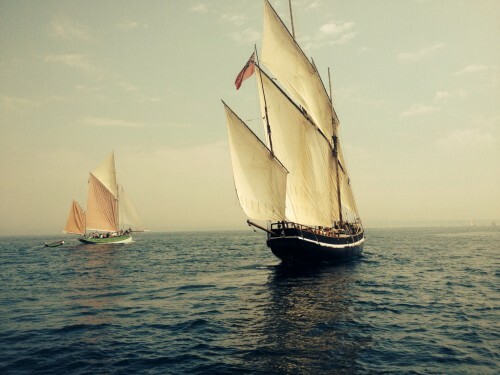 Douarnenez was just around the corner (in time…!) and I realized it was time to get a move on. I sailed Kelpie on delivery down to Gibraltar and as soon as I got back I started all the usual last minute preparations for leaving, which including driving my motorbike up to my Dad’s place in Somerset ang hitching back, finding someone to (not so reluctantly) take care of my bicycle, and giving away lots of the excess wood and random bits that had built up in and around my boat. Finally all was ready and I fondly waved goodbye to Falmouth and all the friends I had made in the two years I had lived in the area; – until next time. I was sailing in convoy with friends Aden and Ellie, on their boat Katla; like Lorema, a small wooden boat without an engine. A frustrating sea breeze slowed our departure, but once we cleared the Lizard, we started making more progress. Once again, the overwhelming feeling of freedom, of having your whole life on your boat, heading into the unknown. A nice fresh wind on the quarter, self steering looking after the helm, my friends never more than a mile or so away, chatting on vhf, dolphins, dinner and sunset. Altogether not too bad. The night was more eventful, dodging the big fellas in the shipping lanes. Aiden and Ellie had a visit from pilot whales, but I only had the boring dolphins – pah! 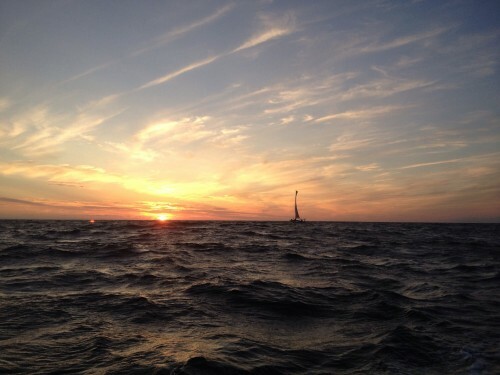 Dawn came, and we were making our way towards the Chanel du Four when we were completely becalmed, luckily some way south of the shipping lanes. We bobbed around for about 6 hours, occasionally sharing profanities towards the wind gods over vhf, but actually mostly just enjoying the lovely sunshine. 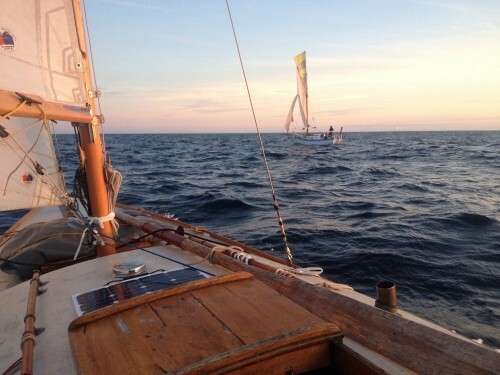 Eventually we got some light winds and made for L’aber Wrac’h, which was some way closer. 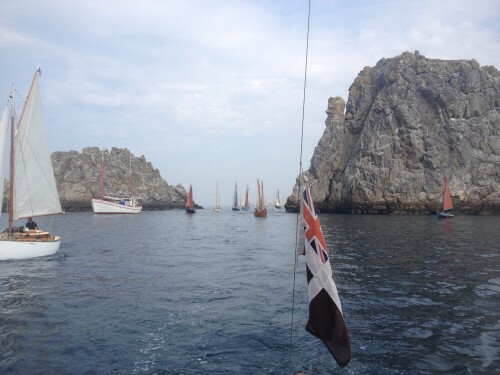 Becalmed again a couple of miles off, and so out came the sculling oars! 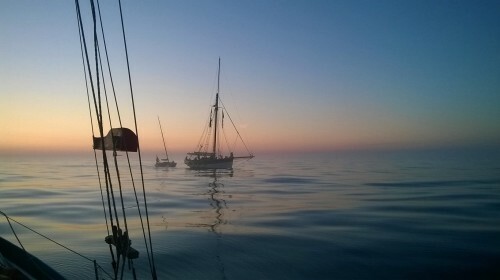 We were making rather slow but steady progress towards the harbour, and taking the strong tide into account, but as it started to get dark again and the fog dropped, none of us were particularly relishing the thought of the pilotage to get in. 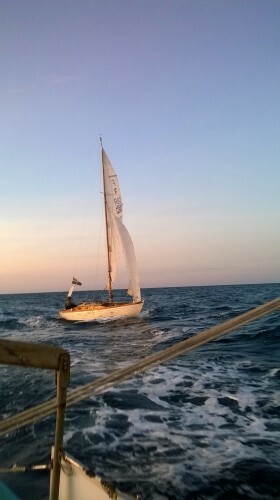 When a gaff sail appeared in the distance bound for L’aber Wrac’h, and turned out to be the Luke Powell pilot cutter Amelie Rose, also from Falmouth, we gladly accepted their offer of a tow for the last couple of miles in! 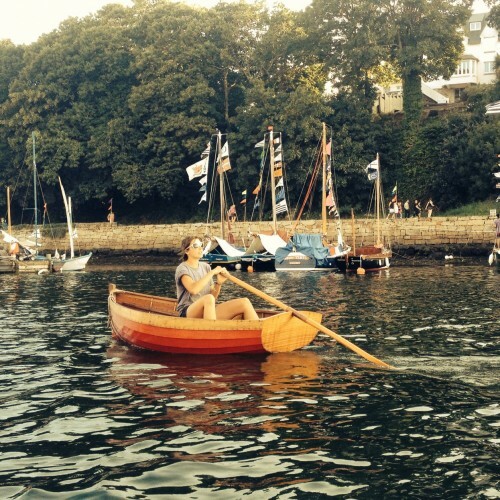 Lines were thrown, beers promised, and the three of us steamed into the harbour, where we were pleasantly supprised to be greeted by a whole flotilla of wooden boats filled with inebriated Cornishfolk. A few jolly days in L’aber Wrac’h, where I got round to painting the other side of my hull, and then the fleet sailed down to Camaret. 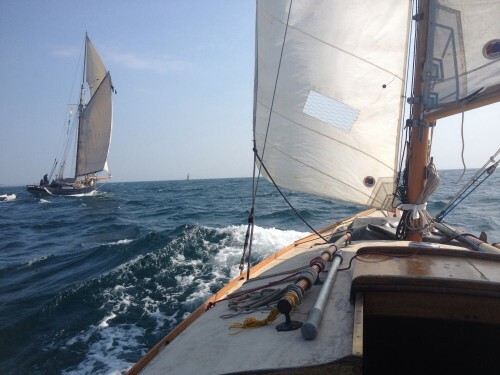 Spinnaker out, 10kn through the Chanel du Four with the tide, right between Snowdrop and Ibis (a lugger and an east coast smack, both based in Penryn river, Cornwall) – not more than 100m between the three of us. More friends in Camaret, old and new, local cider, and (to my famished delight at nearly midnight) what appeared to be some kind of ham soup (soup de jambon?) but which was in fact quite a strong rum punch, which my empty belly accepted with, if not gratitude, then resignation to the night ahead. A bleary departure at 9am with a very large convoy now, and an hour of sculling before I gave up and accepted a tow the rest of the way towards douarnenez, as there was not a breath of wind. It was quite something to see so many boats squeezing through the narrow gap between the gigantic menacing rocks just south of Camaret. I think one or two out of the many engineless boats sculled all the way, to their credit, although I believe they missed the free wine at the opening of the festival. It was my first time at Douarnenez, and it lived up to everything I had heard. Lots of crusty sailors, crusty boats, crusty baguettes, pate, music, wine, racing, swimming, the usual I guess, and I’m not going to go into all the debauchery of the weekend, suffice to say it was much fun.